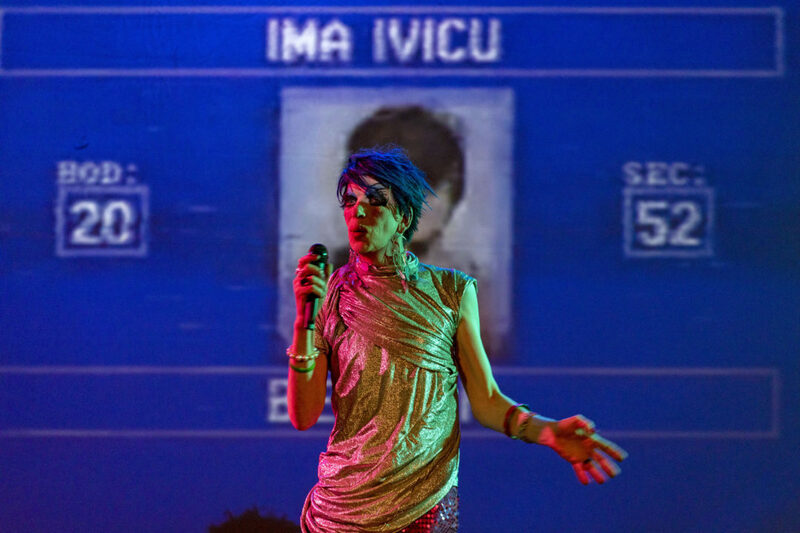 David Hoyle: Living in the NOW! A performance atelier celebrating the lived experience. You can expect an open circle discussion invoking the Spirit of inclusivity and LOVE, drawing or painting. The gathering will culminate in a collaborative group artwork to create a ‘living-mass costume’ to be photographed by Lee Baxter. All are welcome in OUR relaxed inclusive environment. Limited places, we might make a selection if needed. 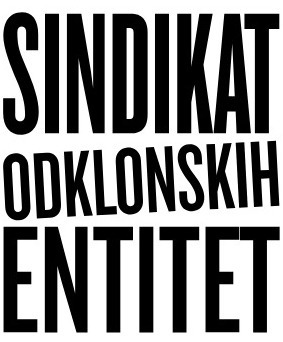 Please send us your application with your contact details (mobile no., email) and short motivation letter at sindikat@emanat.si before Sunday, 26 August 2018. 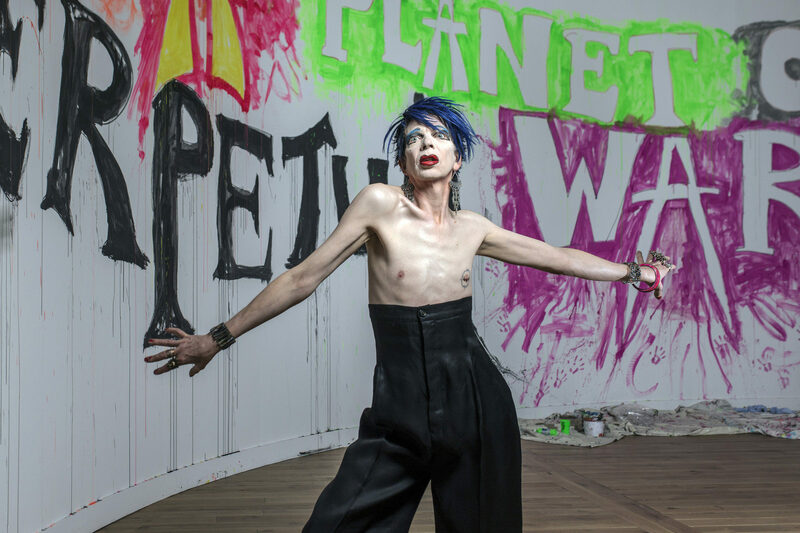 Workshop devised and led by David Hoyle. 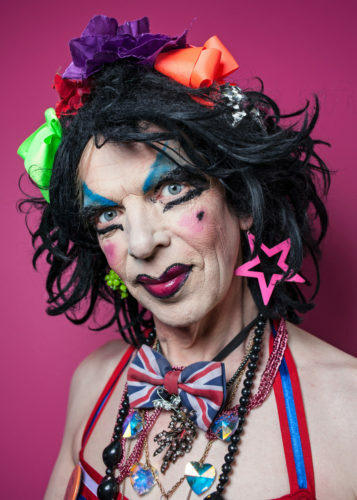 David Hoyle has been bringing his message on the trouble with gender and other political issues to audiences since the 1990s. Without him the gender fluid drag we have become accustomed to in recent years might not exist. He has been a major influence and inspiration, he is an icon and there is nobody like him. Born in 1962 in Blackpool, Hoyle was relentlessly bullied as a child for his effeminacy. At school, both pupils and teachers alike tore into him for years and he later described his journeys to school as akin to walking daily “to his own execution”. 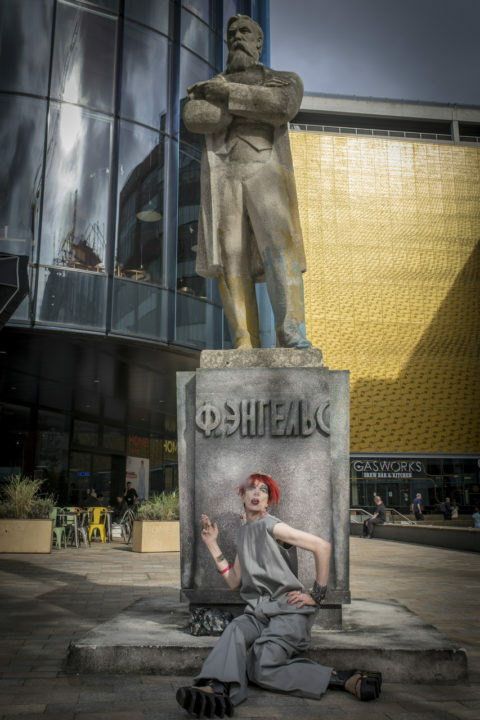 However, this kind of success was not for him and he killed of the Divine David in a performance on an ice rink… after some time out he returned to London’s stages as himself David Hoyle. Some key venues David has played include Sydney Opera House and The Royal Vauxhall Tavern, Tate Modern, The Bethnal Green Working Men’s Club, The Southbank Centre, and Soho Theatre in London along with Contact Theatre and Manchester International Festival in Manchester. Lee Baxter is a Manchester based photographer and graphic designer, he can usually be found in late night establishments amongst the more exotic creatures of the night. Subject wise he jumps from landscapes to portraits to performers, usually with a shared goal to capture a mix of the unexpected, vibrancy, beauty, humour and energy. His images tend to be visualised & constructed from a more graphic perspective, informed by his commercial design experience. Lee has been friends with David for over 25 years, working with him on many projects producing graphics and visuals for a variety of his shows. For the workshop in Slovenia he will help produce a group photographic image in collaboration with David and the participants involved.